Gamers can compete in the Halo 4 Infinity Challenge for a chance to win a UNSC-themed Ford truck. It's been more than 11 years since Halo: Combat Evolved kicked off one of gaming's most successful series alongside the launch of the Xbox. Since then, seven more Halo games have been released, including the recently launched Halo 4. According to Microsoft, the series has now topped 50 million units sold, and players have spent over five billion hours playing Halo games on Xbox Live. In October, Microsoft announced that the Halo series had reached 46 million sales, which indicates that Halo 4 has sold four million units since its November 6 launch. The release generated $220 million in its first 24 hours. If you feel that you have superior Halo 4 skills, Microsoft has also announced a free-to-enter tournament, which begins on December 17. 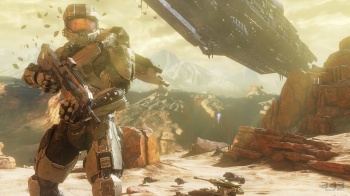 The Halo 4 Infinity Challenge, which is sponsored by Virgin Gaming, will have players competing in War Games and Spartan Ops modes on global leaderboards. The grand prizes are a UNSC-themed 2013 Ford F-150 SVT Raptor truck and a two-minute appearance in the next Halo game, and there will be plenty of smaller prizes as well. You can register at the Infinity Challenge website.